Our grandparents, Sam and Louise Perrella, owned a small café on the Iron Range in Keewatin, MN. 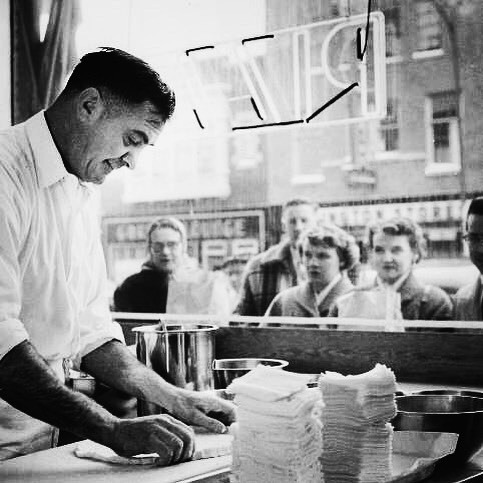 It was during the early 1950s that Sam would listen to stories from World War II veterans about favorite foods they had discovered while serving in Italy. One of those favorites was pizza – something few people on the Iron Range knew anything about at the time. Sam decided he wanted to learn more so he traveled to Chicago to visit some pizzerias, and it was there where he picked up the idea for square cut pieces. The Perrellas combined some traditional family recipes with their own special touches to create their own pizzas. In 1954, after some encouragement from customers who knew they were on to something big, the Perrellas moved their café to Hibbing, MN and Sammy’s Pizza was born. Over the years, Sam invited family members into the business, and more and more Sammy’s locations opened – including one in Duluth’s Lakeside neighborhood in 1958. Jim Acheson Sr. and Marguerite (Perrella) Acheson, opened the restaurant and ran it until in 1978, when their son, Jim Jr., took over. A few years later in 1982, another son, Mike, went to work full time with his brother and never looked back. One morning in late 1999, Mike was headed to work at the Lakeside Sammy’s when a real estate agent stopped him, wondering if he was interested in looking at a piece of property in Cloquet, MN. He had no idea why the man came to him, but he went to look at the property, and on June 20, 2000, he opened Sammy’s Pizza in Cloquet. Now in its fourth generation of pizza artisans across 15 locations, the Sammy’s family continues to uphold Grandpa Sam’s dream. The tastes and traditions of Sammy’s Pizza have gained a cult-like following, as devoted Sammy’s lovers have developed their own traditions around the pizza and the restaurants. Thank you for making Sammy’s a part of your family tradition. We look forward to your next visit!